"Cystoscopy" means to look inside the bladder. What is a cystoscopy (Bladder visualization)? Cystoscopy, or cystourethroscopy, is usually a quick, 45-second procedure that enables Dr. Tony Nimeh to view the inside of the bladder and urethra in great detail. What does a cystoscopy test for? It is commonly used to diagnose bladder tumors, identify obstruction of the bladder, and look for any abnormalities of the bladder and its lining. This allows for optimum evaluation of your condition, leading to the right diagnosis and treatment. Dr. Nimeh have invested in the latest technology available in Fairbanks, Alaska, with flexible, fiberoptic, and camera based systems to make sure that nothing is overlooked. The procedure is usually performed as an outpatient procedure in a urology clinic or treatment room. Prior to the procedure, the patient will need to empty their bladder and will then be positioned on an examination table. 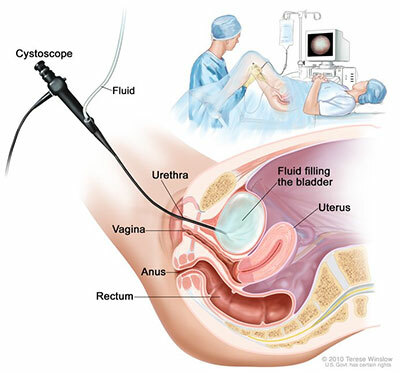 After administration of local anesthesia, a cystoscope is inserted through the urethra into the bladder. The cystoscope is a thin, flexible lighted tube. Fluid is then instilled into the bladder through the cystoscope. As the fluid fills the bladder, the bladder wall is carefully and meticulously evaluated by Dr. Nimeh. Under normal conditions, the bladder wall should appear smooth and the bladder should be normal with regards to its size, shape, and position, and there should not be any blockages. If any tissue in the bladder wall appears abnormal, a small sample can be removed through the cystoscope to be analyzed. The average cystoscopy takes less than one minute. After the cystoscope is removed, the patient’s urethra may be sore and they may feel a burning sensation for up to 48 hours. If discomfort persists, fever develops, or urine appears bright red, a physician should be notified. do you think you have a bladder tumor?